An exhilarating journey through the Algarvian wonders that invites parents and teens to a memorable holiday. Explore the breathtaking cliff-side views of the “7 Vales Suspensos” walking tour and celebrate your coastal adventure with the Diving Wonders experience, by learning the basic elements of scuba diving with a certified instructor and finishing with a practical diving experience in the pool and Ocean. 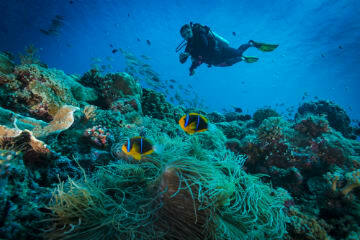 Diving Wonders experience with diving course and practical diving experience in the pool and Ocean. Note: This offer is applicable for stays within Deluxe Family Sea View Room. Minimum age required for the Diving experience is 10 years old.